Those of you planning to travel with your pup on a similar plane, with a similar bag, might want to bookmark this post, so you can show a Southwest rep — in a pinch — that the bag will indeed fit under your seat. It’s also nice that Kathy’s pictures are from May 2014 — it’s just that much more convincing to see a current photo. Thank you again, Kathy, for taking the time to send info back to the Dog Jaunt community (and for your kind praise for the blog)! 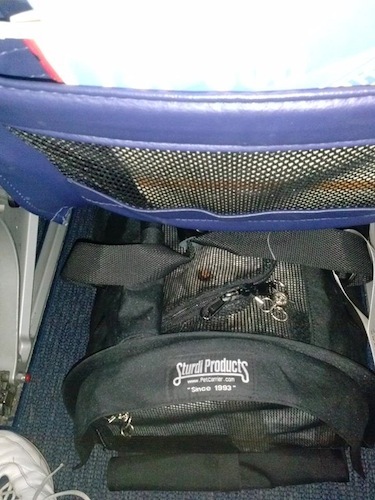 I’m tagging this post so that it joins Dog Jaunt’s growing collection of pictures of carriers in action on planes. Hi, I am getting ready to travel with my puppy on southwest. She is a large small dog…beagle about 23lbs, 11 months old. I am considering the extra large sturdibag but not sure if that will be pushing it vs the the large bag. I want to make sure she will be comfortable. I am taking my yorkie via SW next week. I have 3 carriers at home that I am trying to decide which one to use. Let’s just say that I am totally stressed out since this is the first time we have flow with her. I bought the SW one and hate it. it folds down and I don’t see how she can possibly sit in there without it falling on her head. Her favorite one we use for car rides was bought as a Airline approved one, but I think it is an inch too large for SW measurements. The other one I borrowed from a friend who has used to fly her dog, but I am still not convinced that it will pass. Any advise is greatly appreciated. Hi, Lisa — This is probably too late to help you (I’m so sorry! ), but if you poke around this blog you’ll see that I typically travel with a carrier that is larger than most airlines’ stated maximums. These posts with under-seat measurements are meant to let you know what size space I’ve actually encountered (and other Dog Jaunters have encountered), so you can decide if your slightly-too-large carrier will in fact work. 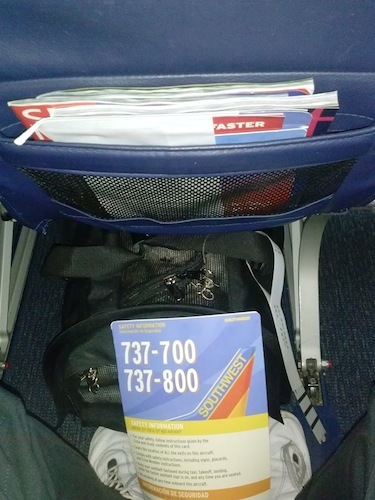 The airlines’ maximums are often written to take into account a life jacket container, for example, that shortens one part of the under-seat space (but not the surrounding parts), so if you have a smallish dog like a typical Yorkie, and a carrier whose top/sides flex (our favorite is the large SturdiBag, which is very flexible), that “oversize” carrier will in fact work just fine. Whoo-hoo!!! Congratulations, DoxieLuv — so glad to hear it went well, and I hope it’s just the first of many trips you guys make together! We are flying from Seattle to Tucson for the first time with our chihuahua Zoe this Saturday. I am happy to be taking her with us, but also anxious because this is new territory for all of us. We purchased a large Sturdibag, mostly based on recommendations here. We will be flying on Alaska Airlines on a 737-900 first and back on a 737-800. Will they make us remove her collar when we carry her through security? She has a microchip, but removing her collar and id tags in a strange place makes me anxious. Anything else we should be considering? Thanks very much! !